High Clear and Ultra Clear Polyester Films are optically clear (HC) and ultra-clear (UL) polyester films available with or without a chemical or acrylic coating. These films are characterized by very high transparency and excellent slip properties. They find primary use as substrate for security, microfilm, photographic and graphic arts, stationary, engineering reproduction materials and many other applications where clarity is of prime importance. 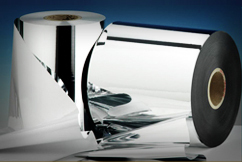 These film have established a good positioning in flexible packaging to offer superior surface gloss. These films are available either untreated or corona treated on the other side. These films possess high clarity, high gloss, low haze and excellent mechanical and thermal properties. Their surfaces can be metallized with excellent metal adhesion and are ideal for security applications such as hologram. They are available in the thickness range of 12 to 50 micron. The prime difference between High Clear and Ultra Clear Films is haze (%), which is on a very lower side in case of ultra-clear films offering high clarity and gloss. These film conforms to EC 10/2011 directives, REACH specifications and US FDA regulations for food contact application.